These simple dreamcatchers are handmade by native artisans from twigs, deerskin leather and feathers. 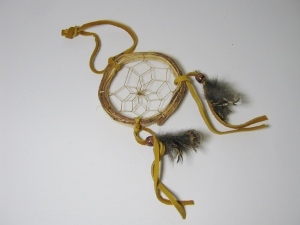 An Extra Small dreamcatcher measured 3" wide (7.6 cm), 11" long (27.9 cm) and 0.25" thick (0.64 cm). 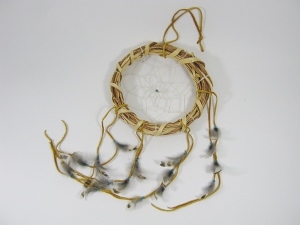 It weighed approximately 7 g. A Large dreamcatcher measured 10" wide (25.4 cm), 33" long (83.8 cm), and 2" thick (5.1 cm). It weighed 100 g.
Genus and species of the feathers are unknown.